Cadassist are the leading BIM training centre in the UK, offering more BIM courses and certified instructors than any other authorised training centre. We can tailor a training course to meet your needs and reflect business priorities, cutting out the time you might spend elsewhere wading through irrelevant content. Cadassist understand that gaining and developing core BIM skills and knowledge will help to develop a more efficient, data-rich and interconnected way. All design team members are grappling with new processes, new deliverables, new ways of partnering and sharing data. It goes without saying that the prerequisite in these transformational times is to learn and adopt new skills in order to respond to these challenges. BIM has been described as equal parts technology, process and people. Firms have invested in computer hardware, networks and faster connection to internet. Some have refined and augmented the processes that support the delivery of design and documentation and content within an increasingly interconnected, co-ordinated project environment. Our approach in delivering BIM Learning Solutions for companies large and small across two continents is the recognition that the attainment of new capabilities cannot be achieved solely through a single training course and/or video clips from YouTube. A comprehensive and sustainable programme is required, with a regular auditable focus on improving performance, quality, output and employee satisfaction and retention. Performance and attainment metrics should be considered as equally significant to the firms’ financial performance and commercial well-being. This ebook highlights what Cadassist could bring to your company or organisation though their BIM training programmes. How across your organisations you could get the right learning needs for your employees. 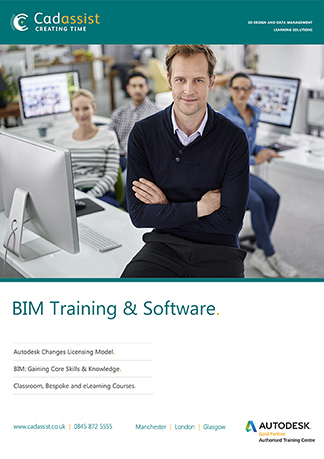 Highlighting the key components of the BIM Learning Strategy, this ebook details key training courses and Autodesk Software that could assist you with your BIM needs.